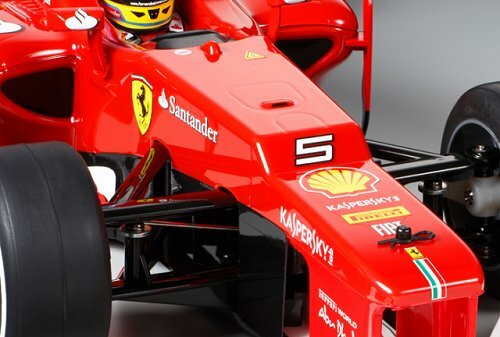 58559 • Tamiya Ferrari F2012 • F104 • (Radio Controlled Model Archive) • RCScrapyard. 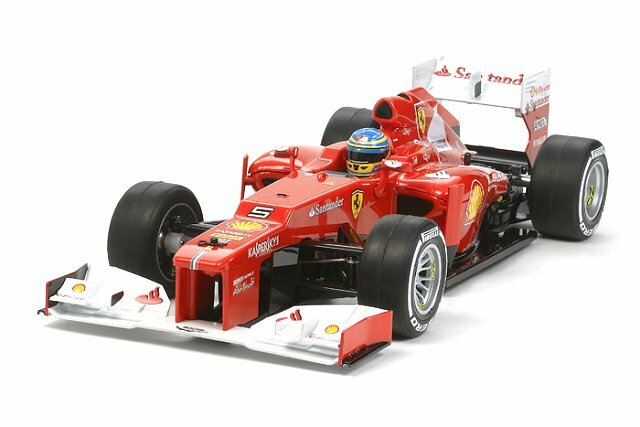 Released by Tamiya on February 27, 2013, based on the F104 Chassis, this Formula One Radio Controlled model, is of the Ferrari F2012 that was driven by Fernando Alonso and Felipe Massa in the F1 World Championships. Seven years after the excellent 4WD F201 chassis and fourteen years after the introduction of the F103RS, Tamiya have gone back to 2WD and produced a chassis design able to compete against the best. The twin deck FRP (Fibreglass Reinforced Plastic) chassis design provides a more rigid structure than its 2WD predecessors and a radically re-designed front end allows for the setting of two different camber angles. At the rear end, the cars suspension employs the usual friction plate and T-bar set up with a coil spring over friction damper. The gear case has been designed to be ground clearance adjustable to match the slick foam tire dimensions as they wear. The smooth action pressure plate ball differential remains, along with the steel axle shaft. The best part of this re-design for me is the re-positioning of the battery to a longitudinal position, vastly improving the centre of gravity and reducing body roll. To reduce costs, Tamiya use plastic and sintered brass bush type bearings for this model. If these are installed, when dust and grit get into them, they will abrade the shafts that spin in them. Therefore I recommend they be replaced by steel shielded ball bearings before first assembly.